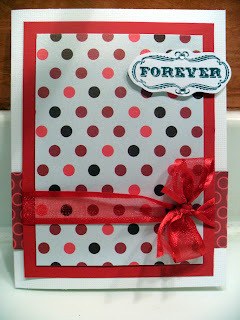 This week's challenge over at Friendship's Garden Challenge Blog is a CAS project showcasing a sentiment. "CAS" stands for "Clean and Simple". It's a great way to get a card done quickly! Another great way to get a card done fast is to follow a sketch. I LOVE sketches! I'm one of those people who takes a realllllllyyyyy long time figuring out a design for a project. I just can't make up my mind! LOL To make things easier and less stressful on myself, I like to make use of sketches. Well, I hope I have inspired you to check out some sketches if you are not familiar with them. They are such a great resource! Thanks for stopping by and have a great day! Love that ribbon. Such a nice touch!! Love your new blog header Dena! Very pretty card and I love how a sketch can get the job done FAST! LOL! !